Waldameer has been around for 116 years, providing fun and entertainment to plenty of families over the years. As the park has grown, it has always tried to make as much available to all of its Guests, including those with a disability. When constructing new rides or extending the midway, it is standard procedure to follow all of the rules and guidelines to make Waldameer accessible to all Guests. Waldameer loves to see families enjoying the park together and by making the park accessible, more families can do just that. 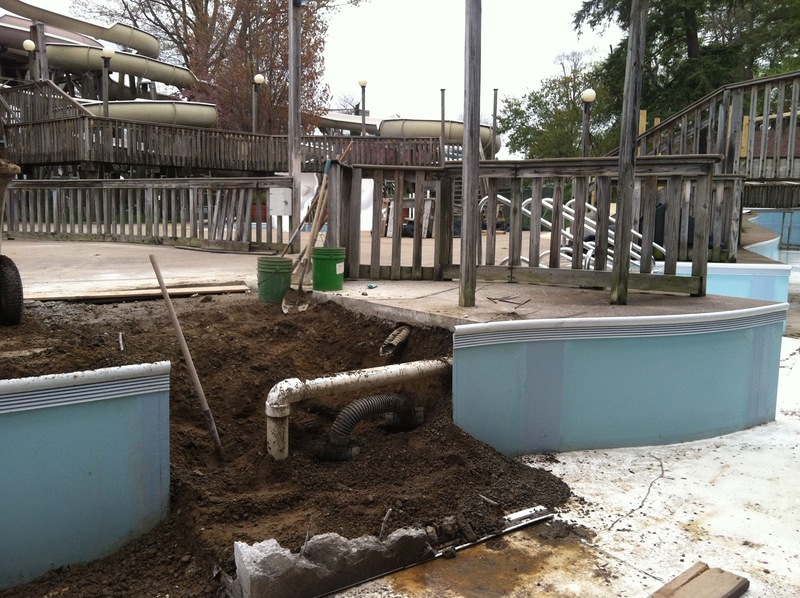 With new regulations and guidelines that went into effect in March of this year, Waldameer made some changes again in order to make the water park more accessible and more enjoyable to more of its Guests. You may have seen a photo or two of the new bridge that spans the Endless River, allowing strollers, wheelchairs, and wagons to cross over into the Kiddie Pool area. 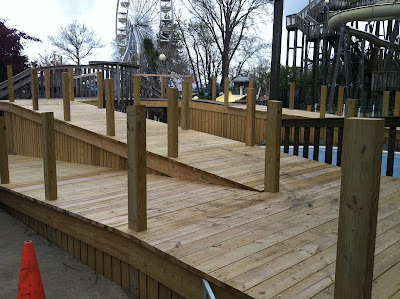 Another project that will be completed before Water World opens for the season will be a special set of steps to allow Guests in wheelchairs to get into the Endless River. These bump steps, as they are called, will be located in the Kiddie Pool area and will make the Endless River more accessible. These projects are big jobs but will provide big improvements to the water park. The more Guests can enjoy Waldameer's family fun atmosphere, the better! Roller Coaster Physics: The Best Kind of Science! We all remember parts of our school days, learning about all sorts of things that make the world go round. Some things were more interesting than others. Most of the time, recess and lunch topped the "Favorite Subjects" list. But not for the Fourth Graders at Fairview Elementary School. Yesterday, they would all say their favorite subject was physics! Potential energy, friction, and gravitational forces... sounds like a blast, right? Not really? 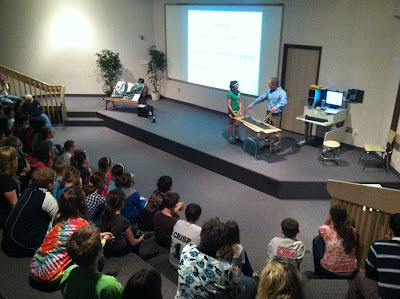 How about when the President of Waldameer comes and teaches you about physics and how it relates to roller coasters! Now we are taking! 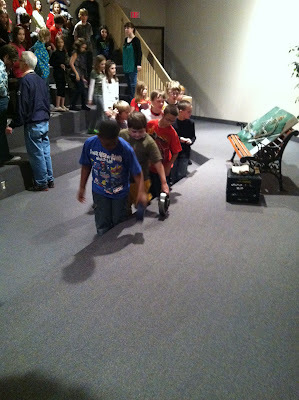 Learning all about kinetic energy and the effects of friction. To bring a real cool, real world example of physics to the students, Steve Gorman visited the school for an hour of fun taking about everything dealing with roller coasters. With a background in mechanical engineering and over 16 years of experience of amusement parks, Mr. Gorman kept the fourth graders on the edge of their seats while they learned about air time, centripetal forces, and how roller coasters stay on the tracks. Up close and personal with parts of Waldameer's roller coasters. Seeing some parts from Waldameer's coasters and learning all about how roller coaster designers use physics to make coasters safe made everyone excited for the upcoming season at Waldameer. With a new appreciating of how roller coasters work, maybe the students will ride the Ravine Flyer II this summer and pay more attention to the moments of greatest potential and kinetic energy and when the most friction occurs between the screams and laughter... then again, maybe not! Well, it's official. Zamperla IS making Waldameer a Happy Swing for this coming summer! Not that anyone had any doubts! These photos were taken in Zamperla's Boonton, New Jersey shop as they tested the lighting package they just finished installing. 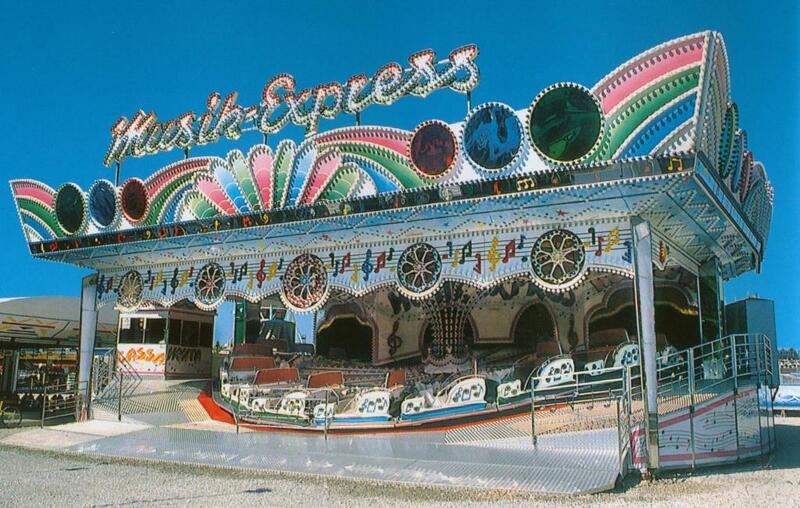 The ride will be the center of attention in Kiddieland this summer with its brilliant white LED lights. This is Waldameer's first time trying out an LED lighting package on a ride. 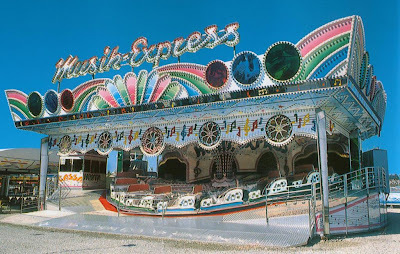 When designing the ride, most of the standard theming was used from Zamperla, including the wave behind the "Happy Swing" letters. There could have been a dolphin jumping the wave above the "Happy Swing" letters, but after a second thought, there aren't any dolphins in Lake Erie! 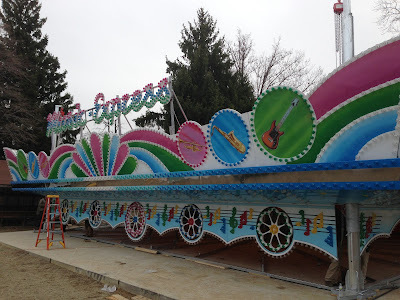 The sides of the ride were customized to make this Happy Swing truly Waldameer's with the signature colored logo on the right side. This fits right with the color scheme of the children's ride. And adults, don't worry, you can ride too! Just like the Frog Hopper, the Happy Swing has larger seats to let you ride with your kids! The ride fits just perfectly into the area in front of the Ravine Flyer 3 kiddie coaster where everyone can see the beautiful ride. You can see all of the construction photos as we prepare for the summer on our Facebook page. That is the most brakes I have seen on a truck! Yesterday afternoon, Velocity magnetics delivered the nine brake sections that will eventually be installed on the 61 year-old Comet. These sleek new brake sections are stacked along the Comet's brake run as two of Waldameer's excelent maintenance staff remove about 175 feet of track steel along the brake run and station. Removing the running steel will allow the new brake sections to be bolted underneath the track stack. Tomorrow, a member of the Velocity Magnetics' maintenance staff will be on site to help install a few of the new brakes. This won't be an easy task. Each brake section weighs about 700lbs each and if you know the Comet, some of the brake run is built over a small ravine. If you ask how our guys are going to install these cumbersome brakes, they all will reply, "Very carefully." The 77th Annual PAPA Spring Meeting took place this past Monday and Tuesday in Hershey, PA where parks, manufacturers and suppliers from around the state gather to discuss important topics, share stories and reconnect with old friends. Waldameer was one of the 11 parks that were represented at the meeting where board meetings and round table discussions took place in order to keep Pennsylvania's wonderful parks successful. Topics such as the new ADA Regulations and Post Labor Day School were some of the big topics on everyone's mind and plenty of discussions focused on learning more about these topics. But just as important were the social aspects of the members as they said hello to old friends and learned about the new things happening around the state at each and every park. It was great fun and very informative and Waldameer is proud to be a member of such a great organization! Captian Hook Lost His Island! Don't ask how, but it seems the infamous Captian Hook has lost his Treasure Island! Well, it isn't really lost (even though he looks pretty lost without it). Winter maintenance has moved on to the project of rebuiling the old backdrop for the nationally renowned Pirate's Cove. Designed by Bill Tracy, this ride has been through 40 years of laughs and scares as Guests walkthrough this pirate themed walk-through. But the backdrop was showing signs of wear and with the wonderful winter weather Erie has experienced, it seemed a great time to rebuild the tired backdrop. Don't worry you die-hard Bill Tracy fans! Waldameer took many photos of the backdrop and are going to restore it to its previous glory. The Art Department at Mercyhurst College has elected to gather a group of exceptional art students to repaint the backdrop and have it ready for display for this coming season. So never fear el Capitan! Your Treasure Island will be found once again. And when it is, cry "Land, ho!" After much planing and engineering, the new braking system project for the Comet coaster is starting to unfold. The first Comet car has returned from Velocity Magnetics where it was fabricated with a new undercarriage that will allow it to function with the new magnetic and pneumatic braking system being installed for 2012. With the first car back in the Waldameer shop, work can now begin on the rest of the cars. The materials for the new undercarriage, provided by Velocity, will be installed by our very own Waldameer mechanics. While the cars get fitted, Velocity is busy working on the pneumatic and magnetic braking sections that will be utilized in the Comet's new brake run. The Comet trains will first hit three sections of static magnets that will slow the train down, followed by five sections of pneumatic friction brakes to slow the train to a crawl. Once inside the station, two more sections of pneumatic friction brakes will hold the car in the unload position as well as the load position. The sections are due to arrive in the next few weeks. The neat thing about Waldameer's new braking system is the fact that we are using both friction and magnets to slow the trains. Typically, coasters use magnet brakes with pinch brakes having a fin under each car. The Comet is unique in that the friction brake pads under each car must also be magnetic. Velocity Magnetics has designed this new system specifically for Waldameer's Comet to keep much of the Comet's history and origianal feel alive. Along with this new braking system comes a new control unit, provided by Terry Hoffman. Once the new brake run is installed, Terry can begin his work computerizing all the functions fo the new hardware. To see more pictures of the Comet car, visit us on Facebook at Waldameer & Water World. After all the excitement from the holiday season has died down and may of us are wondering if it will ever snow again, Waldameer is still keeping busy improving the park for the 2012 season. Pictured below is a prime example of Waldameer's improvments for 2012. But what is it? ﻿What could this bunch of nailed together boards be an improvement of? We will keep you updated on this little project as it comes together. Until then, start guessing!